Watch third-year youngster Corey Gault speak to CollingwoodTV ahead of his senior debut against Hawthorn on Friday night. Watch third-year youngster Corey Gault speak to CollingwoodTV ahead of his senior debut against Hawthorn on Friday night. Young West Australian Corey Gault will make his debut after three years at the Westpac Centre. 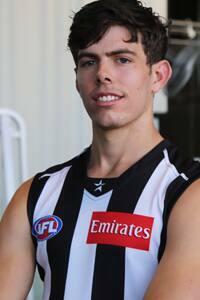 Emerging tall Corey Gault will become the 1200th player to represent Collingwood in its VFA, VFL and AFL history when he lines up to make his debut against Hawthorn at the MCG on Friday night. View player profiles for each player on Collingwood's list since 1892 on the club's brand new historical database: forever.collingwoodfc.com.au. Gault, who was sidelined for two months earlier this season after suffering a broken collarbone, surged into selection consideration over the last few weeks with a series of impressive displays at VFL level. Operating in the forward line and as a ruck, Gault’s performances have been characterised by his contested marking strength, aerial ability and stellar tap work, combining to earn the 21-year old his AFL debut. He is one of three inclusions for the match, alongside Heritier Lumumba and Paul Seedsman, with Brent Macaffer (knee), Clinton Young (hamstring) and Dane Swan (hamstring) all unavailable through injury. Drafted with the 65th pick in the 2011 National Draft, Gault arrived at the Westpac Centre as an athletic but still developing tall capable of rotating through the ruck or holding a key position role at either end of the ground. Prepare for Friday night's blockbuster with collingwoodfc.com.au's Ultimate Preview. Such a description would hold true, with the West Australian’s versatility seeing him fielded in all three positions in the second tier competition, playing a pivotal role in the latter half of the season as he has helped propel the VFL Magpies to a second successive finals series. Lumumba meanwhile returns after missing Collingwood’s stirring eight-point triumph over Greater Western Sydney with a corked thigh. Having played 20 matches this season, averaging 20 disposals, three rebound 50s and three inside 50s per match, Lumumba’s inclusion will provide a necessary dose of experience to a Magpie side coping with the well documented absence of a host of established stars. After a three week stint in the VFL, Seedsman has been called up, ostensibly, to fill the void left by Young’s absence, with his added run and drive, and prodigious long kicking from half back and wing poised to be asset for the Magpies as the team looks to secure an unlikely berth in the finals series. Producing consecutive 24 disposal performances over the last fortnight, Seedsman’s inclusion arrives with his form in the ascendancy, and should be a welcome boost for the Black and White.